The outfit left-hander Garrett Olson wore during a golf outing with teammates Mark Lowe and Shawn Kelley received a lot of comment — on and off the fairways at Blackstone Country Club near Peoria. 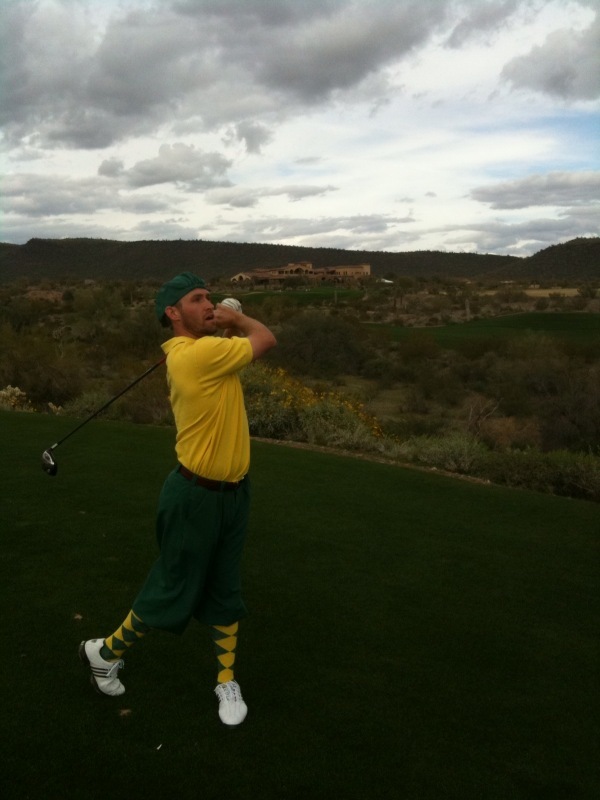 Olson said he purchased the outfit on Ebay for a golf outing at Cal Poly San Luis Obispo (Calif.) this past offseason. His major was mechanical engineering, which probably is just a little more difficult than journalism at San Jose State, my alma mater. And those are the actual school colors, if you can believe it. Olson does not consider himself to be a very good golfer, but he shot a career-best 91 at Blackstone and gave credit where credit was due. “It’s so much easier to play golf when you wear knickers,” he said. The way I have been playing (and just ask Kirby Arnold), I might have to go the knickers route. — Ichiro checked into camp at 2:44 p.m., MT, decked out in his Canada (red and white) sneakers, designer jeans (I think designer), t-shirt, and cap on backwards (ala Griffey). His interpreter said the Mariners right fielder will talk to the (U.S.) media tomorrow. — There will be an intrasquad game on March 1 and possibly another the following day before the team leaves on its annual golf outing against the Padres.